A very favourite travel writer of mine is the late Umaprasad Mukherjee. An avid traveller, he probably popularised the Garhwals to a good three generations of Bengalis. Its criminal that his beautiful travel pieces are available just in Bengali, his native language. So I’ve decided to (unofficially) translate some pieces by him and publish them here. Its impossible to do justice to the man’s way with language, his deep humanism and spiritual attachment to the Himalayas. Hope you like it. It was written sometime in the early Sixties. On the way to Kedarnath, soon after leaving the town of Guptakashi, you can often see, in the distance, a massive blue mountain. Sometimes, towards the end of winter, its peak is covered with a light dusting of snow. Sometimes there’s snow even after the rains. The mountain then looks like a frail old man swathed in a white blanket to shut out the cold. At other times, it is hidden by clouds and mist. Then the mists part and it appears again- a monarch among mountains. This is the third of the five kedars- Tunganath. At some 12,072 feet, Tunganath is the highest temple in the entire Kedar-Badri circuit, making the name a highly appropriate one. The peak itself looms like a massive hooded cobra another thousand feet above the temple- it is called Chandrashila. At approximately 13,000 feet this is higher than both Kedarnath (11,750 feet) and Badrinath (10,244 feet). Not many pilgrims who come to these parts have heard of Madmaheshwar, Rudranath and Kalpeshwar. However, many do know of Tunganath. In fact, it used to be quite popular once upon a time. On the way to Kedarnath lies Guptakashi. Just outside Guptakashi is the village of Nala. This is where a side-track leaves the main road, and branches down to the Mandakini river valley below. You cross the river on a pretty iron bridge, and then climb up to Ukhimath. That was many years ago. Now, a motorable highway has swallowed the track whole, like a big snake swallows a smaller one. This highway bypasses Nala, effectively shutting off the old approach to Ukhimath. Nowadays, you head off to Ukhimath directly from Guptkashi. Before the road came, pilgrims descending from Kedarnath would take the Nala route to Ukhimath. 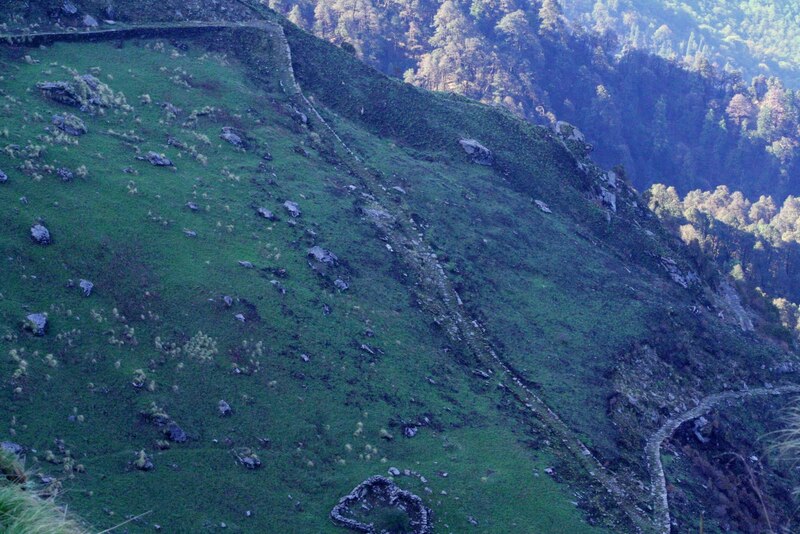 From there they would go further up to Tunganath, cross the mountain and head off towards Gopeshwar. From there, some more hiking would bring them to Chamoli on the Alaknanda river valley. 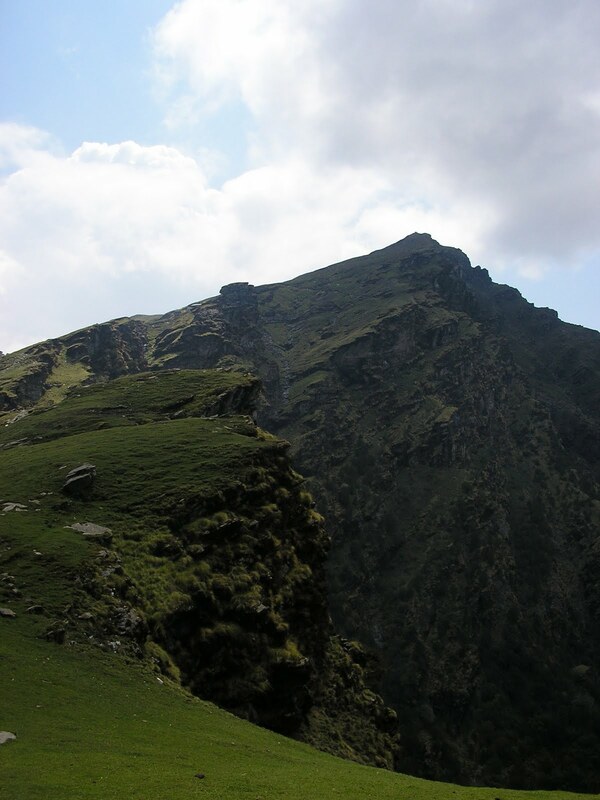 This is where they would find the road to Badrinath. Back then there was no need to come all the way down to the confluence of the Alaknanda and Mandakini rivers at Rudraprayag to get on the road to Badrinath. The Ukhimath-Tunganath-Chamoli route was a much shorter one. 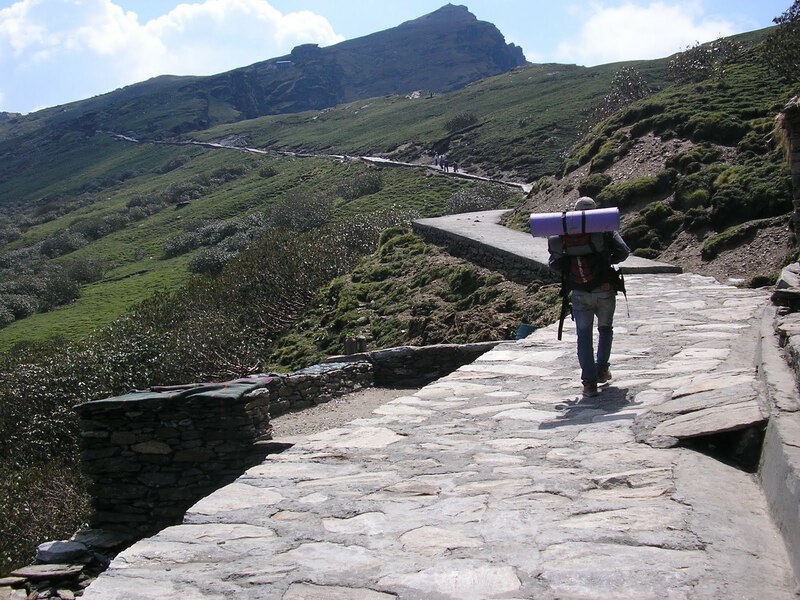 And that way, pilgrims would get to pay their respects at the temples of Ukhimath and Tunganath. But this is the era of buses. So most pilgrims nowadays descend to Guptkashi from Kedarnath and get on a bus, which takes them all the way to Badrinath. You get off the bus, pay your respects at Badri, and get back on the bus. Travellers sigh with relief at being spared a long hike up and down mountains. It is less tiring for sure. After all, the ascent to Tunganath is nothing to sneer at! However, I feel that to come to the Himalayas and then to trade in this 3 day trek for the convenience of a bus is to deprive yourself of an unique experience. After all, the view of the Greater Himalayan peaks that you get from Tunganath is unmatched. The track down from Tunganath affords other pleasures. It passes through a thick forest, another thing you don’t find often on the bus route. There’s nothing to fear here, as there are hardly any wild animals, and a clear track ensures that you don’t lose your way. It winds down gently under the cool shade of the trees past many waterfalls of various sizes. This ancient forest has its own charms. And yet, nobody comes to Tunganath anymore. Even the famed pilgrim town of Ukhimath wears a deserted look. Recently though, a motorable road has made its way to this area. 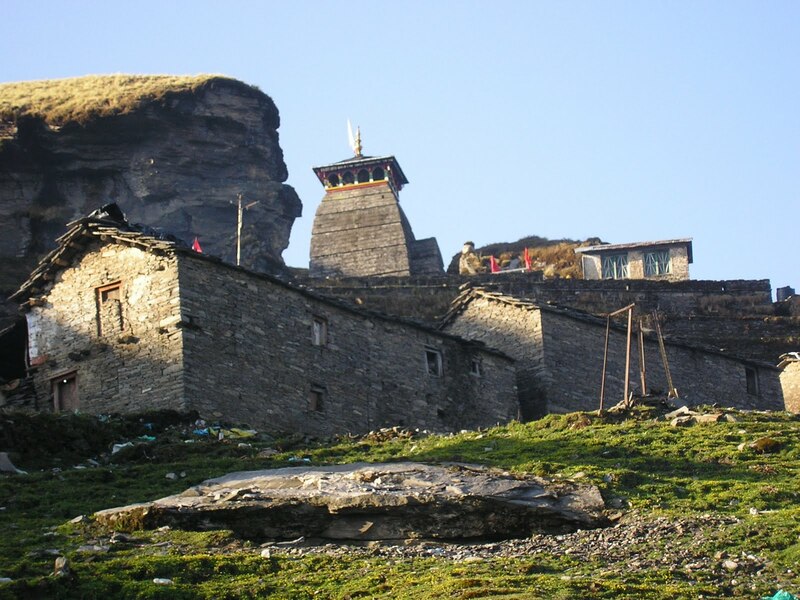 This one comes down from across the village of Kunda, and makes its way under Ukhimath and Tunganath and meets the road to Badrinath at Chamoli. Perhaps in a few years buses will ply this route too. But will that be enough to lure the convenience hungry traveller from the comforts of the bus to make the difficult trek up Chandrashila to see the Himalaya in all its glory? Arrrghhh, in previous comment, I meant to write 'sometimes it SNOWS as early as Sept-Oct when the rains end.' Please to excuse the early senility. Rimi- Fair point. The thing is, though, that Tunganath is one of a series, and in the other ones he makes it clear that there are two good seasons in the Himalayas- pre monsoon and post monsoon. Another thing is that I think back then, the rains pretty much meant the monsoon. But having been there, it is also true that when it rains in Tunganath, due to its height,it also hails. Plus there's sleet. So yes, its a bit ambiguous. And thanks for the warning. Anyways, I'm only serialising Tunganath. Thanks Rimi. This is pretty good. However, the Great Bongs never edited themselves much in the original, which creates problems for us translators. In the first parpagraph he says, 'sometimes it snows even after the rains.' That's a little hard to interpret: does he mean 'In winter, even after it rains, it also snows' or does he mean, sometimes it rains as early as Sept-Oct when the rains end.' The first is close to the literal meaning, but the second makes more sense. As a translator, you're going to have to decide whethe to stick to the literal but possibly misleading route, or to silently edit and interpret. Also Beq, if you're planning at some point to publish this as a book, don't put it all up here. That would count as previous publication. ma said write.you are fulfilling my dream. Ma said…you are fulfilling my dream.wright.. Loved it. Is it possible to retain the Bangla flavour? Or the author's voice? lovely lovely… specially like the visuals, touching off the descriptions. Translation is a good idea, Beqboy. People like me would never read people like him any other way. Thanks.